To lessen the tensions surrounding hurricane season, start gathering supplies, preparing your home and planning for a possible emergency well before the season starts. Use these guidelines to start preparations before disaster strikes. Create a family disaster plan. Identify ahead of time where you will go if you’re told to evacuate. The best choice is a friend’s home outside of your area, or one well away from coastal areas. Other options include a motel or an approved hurricane shelter (remember – during an evacuation, primary and many secondary roads might be clogged with traffic, making leaving very difficult – allow ample time to get out). Have local and regional road maps available in the event you must travel unfamiliar roads and keep handy the phone numbers of the places to which you intend to evacuate. Ask an out-of-state friend to be your “family contact.” After a disaster, it’s often easier to call long distance. Other family members should call this person and tell them where they are. Everyone must know your contact’s phone number. Discuss what to do in an evacuation. Plan how to care for your pets. Meet with your family and discuss why you need to prepare for a disaster. Explain the dangers of fire, severe weather, and earthquakes to children. Plan to share responsibilities and work together as a team. Discuss the types of disasters most likely to happen. Explain what to do in each case. Locate important papers and documents and have them ready to take with you should you need to evacuate, or protected in plastic storage bags if you’re remaining in your home. Driver’s licenses, Social Security cards, proof of residence, insurance policies, wills, deeds, birth and marriage certificates, tax records and photos of your home (exterior and interior) should be included. Check your hurricane supplies from last season and replace what’s needed. Here’s a checklist to help you get started. Conduct a home hazard hunt and make your home as safe as possible. Be sure you’ve done all you can to protect your home from further damage that might occur as a result of wind or water intrusion. Make sure there is only one plug per outlet. Avoid using cube taps or overloading outlets. If you must use an extension cord, use a cord rated for the electrical load and no longer than is really needed. Remove electrical cords running under rugs or over nails, heaters, or pipes. Repair or replace appliances which overheat, short out, smoke or spark. Store flammable liquids such as gasoline, acetone, benzene and lacquer thinner in approved safety cans, away from the home. Place containers in a well-ventilated area and close the lids tightly. Secure the containers to prevent spills. If flammable materials must be stored in the home, use a storage can with an Underwriter’s Laboratories (UL) or Factory Mutual (FM) approved label. Move materials away from heat sources, open flames, gas appliances and children. Create an inventory of your personal belongings with videotape, photos or a written list. Store in a fireproof safe or safe deposit box. Consider purchasing extra coverage (known as “endorsements”) for computers, jewelry, art and other expensive items. Review your insurance coverage. Talk to your insurance agent to make sure you have adequate coverage under your homeowner’s insurance policy. Re-check your insurance coverage limits annually. Make sure your coverage is adequate to repair or rebuild in the current building market. 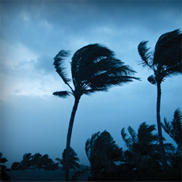 Check your insurance policy for a windstorm or hurricane deductible. These are expressed either as a dollar amount, or as a percentage of the insured value of the home – not as a percentage of the amount of the loss. Insurers offer a range of deductibles; the higher the deductible you choose, the lower your premium will be. Consider buying flood insurance. A separate policy available from the National Flood Insurance Program covers flooding resulting from hurricanes. Flooding, including wind-driven water and storm surge, is not covered by your homeowner’s insurance policy. As reported in USA Today, Mark Zandi, chief economist of Economy.com, believes Hurricane Katrina appears to be an exception to the general rule that hurricanes have little impact beyond their immediate areas. Although the region affected by the storm accounts for just a little over 1% of the U.S. workforce, Zandi says that about $150 billion, or 20%, of U.S. exports and imports in oil, steel, plywood, grains and other goods pass through gulf ports annually.